2012 was a wonderful vintage at Foggy Hill, warmer than average, accumulating 1204°C days of heat during the growing season versus the average of 1135° C days. September to November was warmer and drier than average promoting bud burst and flowering, ensuring an early harvest. The ripening months of December to March were cooler and drier than average allowing the development of the delicate aromas, flavours and subtle tannins of Pinot Noir grown in ideal conditions. Perfect small bunches of Pinot noir were hand harvested from the 9 years-old vines on March the second and were delivered to the Petaluma Winery one and a half hours north of Foggy Hill in the Piccadilly Valley. The harvest analysis of the 2012 Foggy Hill Pinot Noir was exceptional, averaging 24.5 Brix, pH 3.5 and Total Acid of 7gpl. Three clones of Pinot Noir, Dijon clones 114, 115 and 777 from 9 years-old vines were de-stemmed, crushed and chilled separately to 0.8 tonne open fermenters containing 10% chilled whole bunches and with a small addition of sulphur dioxide. The crushed and chilled Pinot Noir must and whole bunches were allowed to sit for 4 days in the 0.8 tonne fermenters, as a cold maceration before addition of our own yeast culture and malo-lactic bacteria. Once fermentation had started the cap of skins was hand plunged on a daily basis, allowing the skins to reach a maximum of 32°C. The fermentation finished after 9 days of plunging and the young wine was allowed to sit in contact with the skins for a further 7 days before pressing. The content of the fermenters was transferred to a small air-bag press and were drained and pressed as separate clones and immediately gravitated to barriques (30% new) with complete lees. By the spring the malo-lactic fermentation was completed and the wines were clear racked and given a small addition of sulphur dioxide and returned to the same barriques. After 10 months in barrique the clonal wines were again clear racked and then blended in preparation for bottling. 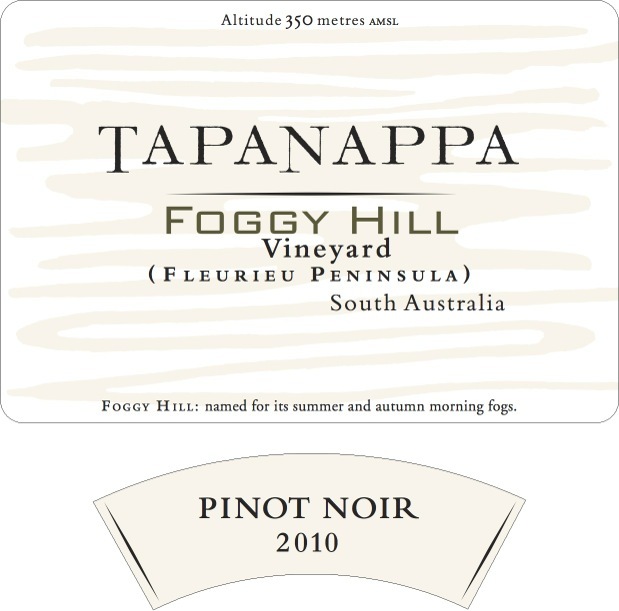 2012 Tapanappa Foggy Hill Pinot Noir was bottled under cork on the 15th of February 2013. Darker in colour than previous Foggy Hill Pinots, 2012 Foggy Hill is a deep and brooding young wine although the intensity of Pinot Noir fruit character is already very evident. Ripe Pinot Noir aromas of black berry-fruits, exotic spice, anise and delicate florals have added complexity of earthy terroir derived characters. What you smell is what you taste in this wine but with a core of sweet fruit on the middle palate and very definite and refined tannin finish. The 2012 Tapanappa Foggy Hill is an example of what to expect from this unique terroir in an excellent warm vintage from mature vines. Bottled in February 2013. Only 730 dozen grown and made.